For other people named Martin Freeman, see Martin Freeman (disambiguation). Not to be confused with Morgan Freeman. Martin John Christopher Freeman (born 8 September 1971) is an English actor and comedian, known for portraying Bilbo Baggins in Peter Jackson's The Hobbit film trilogy (2012–2014), Tim Canterbury in the original UK version of sitcom mockumentary The Office (2001–2003), Dr. John Watson in the British crime drama Sherlock (2010–present), and Lester Nygaard in the dark comedy-crime drama TV series Fargo (2014). His other notable film roles include the romantic comedy Love Actually (2003), the comic science fiction film The Hitchhiker's Guide to the Galaxy (2005), the semi-improvised comedy Nativity! (2009), the comedic Three Flavours Cornetto trilogy, most prominently in the sci-fi comedy The World's End (2013), and his portrayal of Everett K. Ross in the Marvel films Captain America: Civil War (2016) and Black Panther (2018). Among other accolades, he has won an Emmy Award, a BAFTA Award, an Empire Award, and a Screen Actor Guild Award, with nominations including two other Emmy Awards, two other BAFTA Awards, a Saturn Award, and a Golden Globe Award. Freeman was born in Aldershot, Hampshire, the youngest of five children. His parents, Philomena (née Norris) and Geoffrey Freeman, a naval officer, separated when Freeman was a child. When Freeman was 10 years old, his father died of a heart attack. Freeman attended the Salesian School, Chertsey before attending Brooklands College for media studies. His older brother Tim became a musician with the group Frazier Chorus. Freeman attended the Central School of Speech and Drama and has appeared in at least 18 TV shows, 14 theatre productions, and several radio productions. He is notable for his role as Tim Canterbury in The Office, a role which, he said in 2004, "cast a very long shadow" for him as an actor. He appeared in the sitcom Hardware. He also appeared in several films, including Ali G Indahouse (2002) and Love Actually (2003). He began to move into more serious dramatic roles on television with his appearance as Lord Shaftesbury in the 2003 BBC historical drama Charles II: The Power and The Passion. He can also be seen making a brief appearance in the first episode of the second series of This Life. Freeman also starred in the BBC television series The Robinsons and had a cameo in episode 1 of Black Books. In 2007, he appeared in The All Together written and directed by Gavin Claxton, as well as the Bill Kenwright theatre production of The Last Laugh. He is featured in the video for Faith No More's cover of "I Started a Joke". In May 2009, he starred in Boy Meets Girl, a four-part drama that charts the progress of characters Veronica and Danny after an accident which causes them to swap bodies. He plays Dr. John Watson in Sherlock, the BBC contemporary adaptation of the Sherlock Holmes detective stories. The first episode of Sherlock, "A Study in Pink", was broadcast on 25 July 2010 to critical acclaim. For his performance in the role he won the BAFTA award for Best Supporting Actor, 2011 and the Primetime Emmy Award for Outstanding Supporting Actor in a Miniseries or a Movie. He played Bilbo Baggins, the main character, in the three-part Peter Jackson film series The Hobbit. Accolades that his performance in the first part, The Hobbit: An Unexpected Journey, garnered him include Best Hero at the 2013 MTV Movie Awards and Best Actor at the 18th Empire Awards. Freeman appeared in all three of Simon Pegg and Edgar Wright's comedic Three Flavours Cornetto trilogy, commencing with a brief non-speaking role in Shaun of the Dead as Yvonne's boyfriend, Declan, followed by a brief cameo in Hot Fuzz as a police officer. He was a main cast member in the 2013 finale to the trilogy, The World's End. On 5 October 2013, he was presented with a fellowship bearing his name by the members of University College Dublin's Literary & Historical Society. In April 2014, Freeman began playing insurance salesman Lester Nygaard in the dark comedy-crime drama series Fargo. For his performance in this series, he was nominated for a Primetime Emmy Award, a Golden Globe Award, and a Critics' Choice Television Award. He opened in the title role in Shakespeare’s play Richard III in July 2014 at Trafalgar Studios. In 2015, Freeman starred as producer Milton Fruchtman in the television film The Eichmann Show, based on the filming, by blacklisted TV director Leo Hurwitz, of the 1961 trial of Nazi war criminal Adolf Eichmann. The film intercut dramatic scenes with historical footage from the trial. The Daily Telegraph described the film as "absolutely enthralling". He also played Everett Ross in Captain America: Civil War, which released in May 2016. In 2017, Freeman starred in Cargo, which premiered at the Adelaide Film Festival on 6 August 2017. The film is a feature length remake of a 2013 short film of the same name. Later in the year he appeared opposite Tamsin Greig in Labour of Love, a political comedy by James Graham, at the Noël Coward Theatre. Labour of Love charts both the evolution of the UK Labour Party in recent decades, and its presence in a tight-knit Nottinghamshire community. Freeman portrays fictional Labour MP David Lyons, whose modernising ideas pit him against the traditional left-wing constituency agent Jean Whittaker (Greig). Freeman lived in Potters Bar in Hertfordshire with his partner, actress Amanda Abbington. The couple have two children together. They have appeared in other productions together, including Sherlock, Swinging with the Finkels, The Debt, The Robinsons, and The All Together. On 22 December 2016, Freeman announced in an article in the Financial Times that he and Abbington had separated. Freeman is a close friend of actor Simon Pegg, who is godfather to his son, Joe. In an edition of Who Do You Think You Are? aired on 19 August 2009, Freeman discovered that his grandfather, Leonard Freeman, was a medic who was killed a couple of days before the Dunkirk evacuation in May 1940 World War II. Leonard's father, Richard, born blind, was a piano tuner and organist at St Andrew's Church, West Tarring, and later a music teacher in Kingston upon Hull. Freeman is a vegetarian. He has said his Catholic faith remains intact. In 2011, Freeman umpired a charity cricket match to raise money for victims of the Christchurch earthquake. Freeman's personal style follows that of British mod subculture and he cites Paul Weller as one of his heroes and influences on his style. 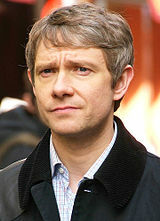 Freeman is a big fan of soul, motown and jazz music, presenting an episode of BBC Two's The Culture Show in 2009 entitled "Martin Freeman Goes To Motown". He has also selected music in the past for a motown compilation entitled Made To Measure and has recently worked on a jazz compilation with friend Eddie Piller entitled Jazz On The Corner, which was released on Acid Jazz Records on 23 March 2018, featuring tracks by musicians including Kamasi Washington and The Brand New Heavies. The pair presented Craig Charles' Funk and Soul Show on 31 March. In 2019 a follow-up album to Jazz on the Corner was announced, entitled Soul on the Corner featuring tracks by artists including Leroy Hutson and Bobby Womack. In June 2018 Freeman was part of To Provide All People, a BBC Wales drama celebrating 70 years of the National Health Service. Freeman is a supporter of the Labour Party. As a teenager, he supported Britain's now-defunct Militant political group and volunteered with the Labour Party Young Socialists. In 2015, Freeman appeared in a party political broadcast to endorse the Labour Party ahead of the 2015 UK general election. In August 2015, he was an outspoken supporter of Jeremy Corbyn's campaign in the Labour Party leadership election. ^ a b c "Martin Freeman on Sherlock, politics and why he's not on Twitter". Financial Times. Retrieved 22 December 2016. ^ "Martin Freeman (April 2012)". Slow Boat Records. Retrieved 29 May 2013. ^ Larman, Alexander. "Freeman, Martin (b. 1971)". BFI Screenonline. Retrieved 1 January 2012. ^ a b "Martin Freeman". Who Do You Think You Are?. Retrieved 3 July 2012. ^ "Interview: Martin Freeman, Actor". The Scotsman. 27 November 2009. ^ a b c "Martin Freeman: No ordinary Bilbo Baggins". The Independent. 30 November 2012. ^ Meritt, Stephanie (22 February 2004). "Tim for a change". Guardian. London. Retrieved 15 August 2015. ^ Boy Meets Girl Interview: Martin Freeman profile Archived 2 May 2009 at the Wayback Machine, Tv.sky.com (30 April 2009); retrieved 27 August 2011. ^ "Martin Freeman to play Bilbo Baggins in The Hobbit". BBC News. 22 October 2010. Retrieved 24 October 2010. ^ Child, Ben (22 October 2010). "Martin Freeman as Bilbo Baggins, a match made in Hobbit heaven". Guardian. London. Retrieved 24 October 2010. ^ a b Calautti, Katie (15 April 2013). "Bilbo Baggins Beats Snow White For Best Hero At MTV Movie Awards". MTV Movie Awards. ^ a b Szalai, Georg (25 March 2013). Sam Mendes Win Empire Awards in U.K. for 'Skyfall', The Hollywood Reporter. ^ "Martin Freeman interview: 'I had no interest in Fargo just being a TV version of the film'". The Guardian. Retrieved 12 May 2014. ^ Lowry, Brian (10 July 2014). "2014 Emmy Awards: 'Game of Thrones,' 'Fargo' Lead Nominations". Variety. Retrieved 12 January 2016. ^ Swift, Andy (11 January 2015). "Golden Globes 2015: Gina Rodriguez, Transparent, The Affair Win Big". TVLine. Retrieved 12 January 2016. ^ Prudom, Laura (20 June 2014). "Critics' Choice Awards: 'Breaking Bad,' 'OITNB,' 'Fargo,' 'Normal Heart' Among Top Winners". Variety. Retrieved 12 January 2016. ^ Gerard O’Donovan (20 January 2015). "The Eichmann Show, review: 'absolutely enthralling'". Telegraph.co.uk. Retrieved 20 January 2015. ^ "Martin Freeman interview: The actor on hobbits, Cumbermania and his Nazi-hounding role in The Eichmann Show". The Independent. Retrieved 20 January 2015. ^ De Semlyen, Phil (22 February 2016). "Martin Freeman's Captain America: Civil War character revealed". Empire. Retrieved 22 February 2016. ^ "Cargo' set for world premiere at Adelaide Film Festival". 2 August 2017. ^ Giroux, Jack (24 September 2016). "'Cargo' First Look: Martin Freeman Stars in the Zombie-Infested Drama". /Film. ^ a b "Martin Freeman and Sarah Lancashire star in James Graham's Labour of Love at the Noel Coward Theatre". londontheatre.co.uk. 19 May 2017. Retrieved 19 May 2017. ^ McLean, Craig (26 May 2013). "Amanda Abbington: Sherlock's Martin and Benedict have a fantastic chemistry". Radio Times. Retrieved 6 February 2014. ^ "The Hitchhiker's Guide to the Galaxy Q&A". blogspot.co.uk. Retrieved 13 January 2017. ^ "Martin Freeman on the Sherlock special, celebrity, politics and being "gobby"". 1 January 2016. Retrieved 19 January 2019. I turned down 25 grand, or whatever, to advertise a burger chain. I'm vegetarian. ^ "Martin Freeman: No ordinary Bilbo Baggins". The Independent. Retrieved 21 April 2014. ^ NZPA and Greer McDonald (April 2011). "Charity Match Benefits Christchurch Effort". The Rugby Corner. Archived from the original on 27 September 2014. ^ Franklin-Wallis, Oliver. "GQ&A: Martin Freeman on the Hobbit, Sherlock erotica and why he hates stylists". Retrieved 6 March 2018. ^ "Martin Freeman Always Looks Sharp". Esquire. 5 December 2012. Retrieved 6 March 2018. ^ "Martin Freeman Goes to Motown, 2008/2009, The Culture Show Uncut – BBC Two". BBC. Retrieved 6 March 2018. ^ "Acid Jazz Records | Martin Freeman and Eddie Piller present Jazz On The Corner". www.acidjazz.co.uk. Retrieved 6 March 2018. ^ "Martin Freeman and Eddie Piller sit in, The Craig Charles Funk and Soul Show – BBC Radio 6 Music". BBC. Retrieved 10 April 2018. ^ "Acid Jazz Records | Martin Freeman & Eddie Piller present Soul On The Corner". www.acidjazz.co.uk. Retrieved 5 April 2019. ^ "BBC Wales marks NHS at 70 with all-star production To Provide All People". ^ Mason, Rowena (3 April 2015). "Hobbit star Martin Freeman appears in Labour election broadcast". theguardian.com. Retrieved 3 April 2015. ^ Wylie, Catherine (28 August 2015). "Sherlock star Martin Freeman backs Jeremy Corbyn as 'most impressive'". Belfast: Belfast Telegraph. Retrieved 15 July 2017. ^ "The 48 Hour Film Project: Behind the Scenes". Pixiq. February 2011. Archived from the original on 14 February 2011. Retrieved 12 February 2011. ^ "Best Actor – Martin Freeman". Empire. Retrieved 26 March 2013. ^ "Best Scared-As-S**t Performance". MTV Movie Awards. Retrieved 29 May 2013. ^ "Best Actor Dagger 2014". Specsavers Crime Thriller Awards. Retrieved 12 January 2015. Wikimedia Commons has media related to Martin Freeman.